A big bundle of highway improvements have been underway in Prince George to keep commuters, commercial vehicles and local traffic safely on the move. Here are some highlights of our package of PG projects. This biggest project in the bundle has many pieces to it. The largest is the 3.4-kilometre expansion of Highway 16 to four lanes, west of the city, from Bunce/Gauthier to just east of Jensen Road. When completed, the highway will be a continuous 10.5 kilometre stretch of four lanes, west from its junction with Highway 97. Complementing this work are upgrades to the Bunce/Gauthier, Haldi Lake Road and Blackwater/Sykes intersections, plus safety improvements to Buckingham Road. 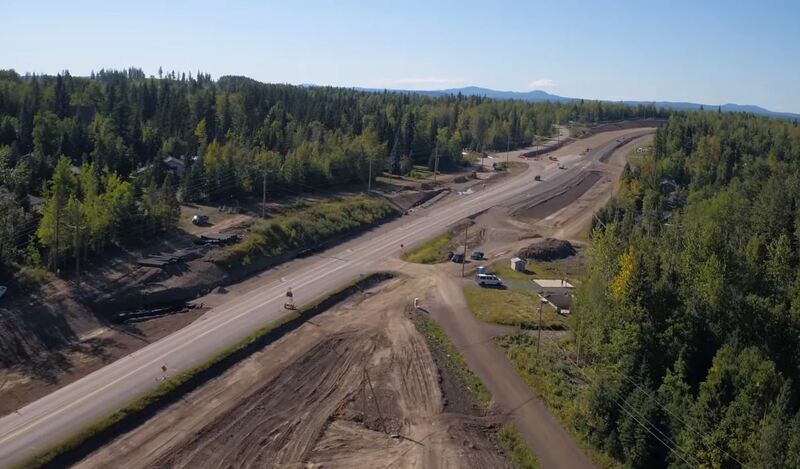 Get a drone’s eye view of work underway on Highway 16, in 2017. The major two-year project is now more than halfway through, and traffic adjustments will continue until we’re all done in 2018. The eastbound turn from Blackwater Road to Highway 16 currently requires drivers to yield, but once construction is finished (and workers and equipment are safely out of the way) it will once again be a merge. Thanks for your patience during construction, as we work to keep you moving! A special aspect of the project is the pedestrian underpass improvements and new sidewalk for students attending Vanway Elementary School, and others who walk through area. High waters in spring sometimes caused the underpass to flood, requiring students to cross at the highway. We’re installing a shiny new culvert in the underpass and positioning it to ensure the underpass stays open year round and pedestrians keep dry. New lighting will also be installed inside to brighten things up. This location will be further illuminated with luminaires at Highway 16 and Blackwater/Sykes Road. One weighty consideration with this multi-aspect project was the impact of highway widening, on a nearby pond. We didn’t want to fill in the pond, however we needed a way to keep the widened highway and water safely apart. We’ve opted for a soil slope to protect the road, and best preserve the water feature. While at first the barrier will look like a hill of plain brown dirt, over time it will sprout with greenery – beauty! A further help to motorists travelling on Highway 16 west of Prince George, was the installation of signals, at the Bear/Kimball intersection, in 2017. Traffic now flows more efficiently and safely there, plus there’s a new right turn lane for traffic travelling westbound on Highway 16, onto Kimball Road. The area is also easier and safer for pedestrians to cross. The traffic islands for the project will be finished off in 2018. Another project recently completed, was extending the access road from Pine Centre Mall to Highway 97. This has changed entry onto the highway from a yield lane to a full merge lane, reducing the backup of shoppers’ vehicles and making it safer for everyone. Our multi-pack of Prince George projects strongly reflects community priorities. 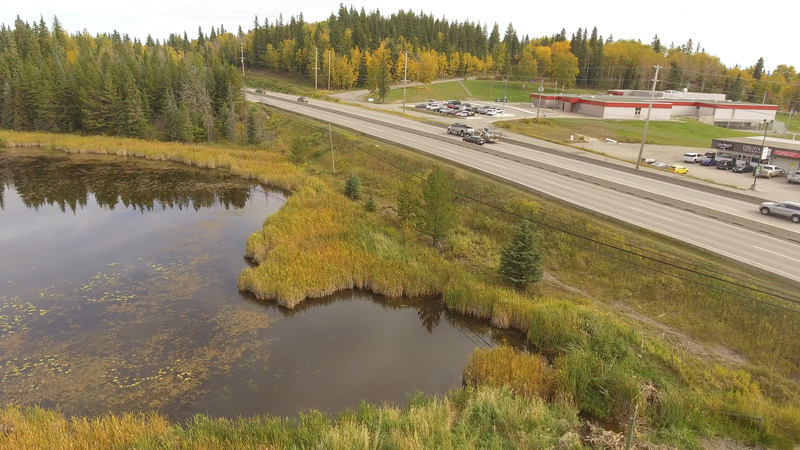 The work has been influenced by the ongoing Highway 16 arterial planning study that we’re conducting with the City of Prince George, to identify improvements to the route and open up access to the growing west side of PG. We also heard from local people at a public open house where we displayed and discussed proposed designs for the Bunce to Blackwater project. The city has been partnering with us on some projects by contributing funding, and is improving municipal roads that feed onto provincial highways, adding sidewalks, improving lighting and doing intersection upgrades on feeder routes. (Note: The federal government has also provided funding for the Bunce to Blackwater project). Local expertise and skills are great direct contributors to these projects completed or underway. Prince George’s IDL Projects Inc. is the main contractor for the big Bunce to Blackwater Road project. Work at the Bear and Kimball Road intersection was largely done with local equipment and operators. 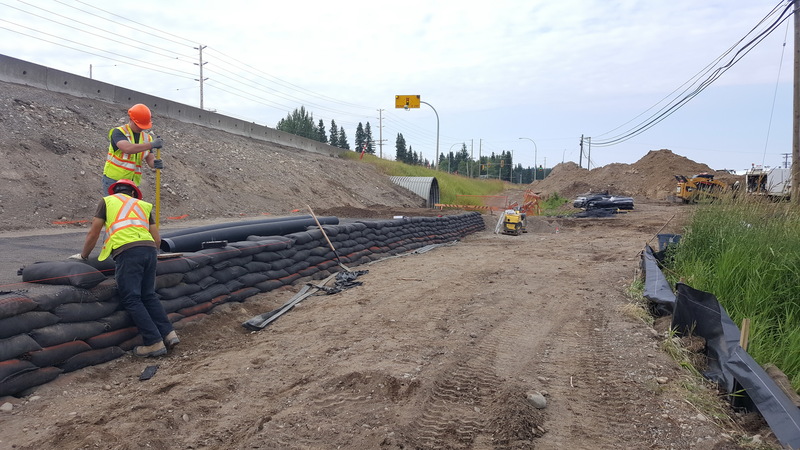 Ministry, municipal and local efforts and are moving this big bundle of highway improvements forward in Prince George, to keep motorists rolling safely, reliably and efficiently along. While there is a saying that good things come in small packages, in this instance, good things are coming in big packages. Whyyyyyy is it 70 km/h for THIRTY KILOMETERS just west of PG???? That is just painful! There’s no reason for it. No one is working. The road is fine. I obeyed the posted speed limit today, and I ended up with 15 vehicles behind me in a parade, and then they all passed me, so I just kept pace with them, and they all did 100 km/h. Hi Stephanie – is this posted speed limit in the construction zone? Yes, there are white 70 km/h signs MANY times throughout the whole “work zone” but there is no work being done. The entire 30+ kilometers appears to have been recently resurfaced, and there are temporary road markings, but that’s it. According to others I’ve talked to, it’s been that way for a long time now. It’s gotten to the point where most people just ignore it (I saw some VERY dangerous driving by a couple of impatient drivers), while others try to hover around 80 so as not to break the law too much, and then when passing lanes come, there’s a big scramble to get ahead of people who are obeying the signs. It just seems to be a forgotten project. It’s really confusing! Hi Stephanie – thanks for the additional info – we will send to the area manager for review. Construction site speed limits remain in place even though workers are not on site. Other hazards, such as temporary line markings and unmarked shoulder drop offs still exist which is why lowered speed limits are left in place after workers have left the site. We will let you know what we hear from the project manager. The 70 km/hr speed limit remained in place throughout the course of the project because the full project length was ‘opened up’ for construction. Even though it may have looked like certain sections were complete, another layer of asphalt was still required. We have been advised that the speed limit from the east end of the project all the way through to Norman Lake Intersection has now been raised back to 100 km/hr. The speed limit from Norman Lake intersection through to the west end of the project, remains at 70km/hr since the contractor is continuing to pave between these points. In order to reduce delays to the travelling public, the contractor is now working at night as opposed to during the day. We thank the public for their continued patience as we work to complete these highway improvements. Any other questions can be directed to the Project Manager, Catherine Deol, at 250-565-4108. Thank you! I appreciate your response. I did notice that part of it was back to 100 km/h which is good to see.